York is so easy to get about and everything is within walking distance so join us and soak up the city's medieval charm and scents of spiced mulled wine this season, as fairs, family fun and festival flavours transform York into a festive fairytale. As well as being voted the UK's Most Festive City in 2017, York St Nicholas Fayre won 'Best Large Speciality Market' at the Great British Market Awards in 2019. York is one of Englands finest and most beautiful historic cities. Despite the historical nature of the city York is truly accessible with everything in walking distance. Soak up the citys medieval charm and scents of spiced mulled wine this season, as fairs, family fun and festival flavours transform York into a festive fairy-tale. York St Nicholas Fayre won Best Large Speciality Market at the Great British Market Awards in 2019. We depart from your selected pick-up point, join your coach and travel to Harrogate, the renowned spa town that exudes genteel calm and elegance and voted The Happiest Place to Live in the country. Time to obtain lunch and enjoy this truly beautiful Yorkshire town before we continue to our hotel arriving late afternoon, time to relax before dinner. 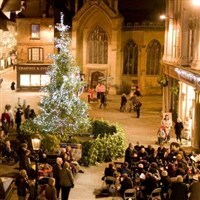 Today we visit the most popular festive market  York  it is more Christmassy than ever before. Take a leisurely stroll along St Nicholas Fair and soak up the festive atmosphere as you discover fine Yorkshire produce from crafters and makers showcased at the Made in Yorkshire Yuletide Village. If you are looking for more traditional Christmas gifts, wander amongst the many alpine chalets on Parliament Street. After a relaxing breakfast we depart our hotel and head into Leeds to explore the Christkindelmarket, one of the largest and most established German Christmas Markets creating a unique continental festive atmosphere in the heart of Leeds City Centre, depart for home mid-afternoon. · 2 nights accommodation, dinner & breakfast. Situated between the cities of Leeds and York, this contemporary 3-star hotel is an idyllic base to explore the local area. The hotel has an abundance of amenities including free WiFi, extensive landscaped gardens, sun terrace; restaurant and a welcoming bar and lounge. Having recently undergone a million-pound refurbishment the hotel prides itself on being known for comfort and relaxation, tastefully decorated and well-appointed bedrooms have all the amenities that you would require including tea/coffee making facilities. From your selected pick-up point, join your coach as we travel to Harrogate the renowned spa town that exudes genteel calm and elegance and voted the happiest place to live in the country. Time to get lunch and meander this truly beautiful Yorkshire town before we continue to our hotel arriving late afternoon, time to relax before dinner. Today we visit the most popular festive market - York - it is more Christmassy than ever before, take a leisurely stroll along St Nicholas Fair and soak up the festive atmosphere as you discover fine Yorkshire produce from crafters and makers showcased at the Made in Yorkshire Yuletide Village. If you are looking for more traditional Christmas gifts, wander amongst the many alpine chalets on Parliament Street. Situated between the cities of Leeds and York, this contemporary 3-star hotel is an idyllic base to explore the local area. The hotel has an abundance of amenities including free WiFi, extensive landscaped gardens, sun terrace, restaurant and a welcoming bar and lounge. Having recently undergone a million-pound refurbishment the hotel prides itself on being known for comfort and relaxation, tastefully decorated and well-appointed bedrooms have all the amenities that you would require including tea/coffee making facilities. 2 nights accommodation, dinner & breakfast.